Tomorrow is the 70th anniversary of Victory over Japan (VJ) Day. On 15th August 1945 the Japanese Emperor Hirohito formally surrendered unconditionally. My maternal grandfather and his brother both served in the Far East. I only met my Great Uncle once when he came back from Australia for a visit when I was about 7. My Grandfather died when I was almost nine, but he spoke to me a few times about what he did in the war. Their stories are all but forgotten. I have a picture of my Great Uncle in uniform, I’m not sure where or exactly when it was taken but my suspicion is that it is a post-war photo (he’s wearing a 2 year good conduct stripe). The details have been forgotten. On the back it tells me that he was in A Company, 2nd Battalion of the Argyll and Sutherland Highlanders. One of my Grandfather’s stories was about a surprise meeting with his brother while out for the night in Calcutta in North West India. David had volunteered for the Argylls and was very surprised to find his brother in India. What this story tells me is that David couldn’t have been taken prisoner with the rest of 2 Argylls when Singapore fell. However I have no idea how he escaped. The 2nd Bn Argylls was the only jungle trained Infantry Battalion in the Singapore. Their Commanding Officer, Lt.Col. Ian Stewart, was seen as being eccentric in training his men to fight in the jungle and in the middle of the day. 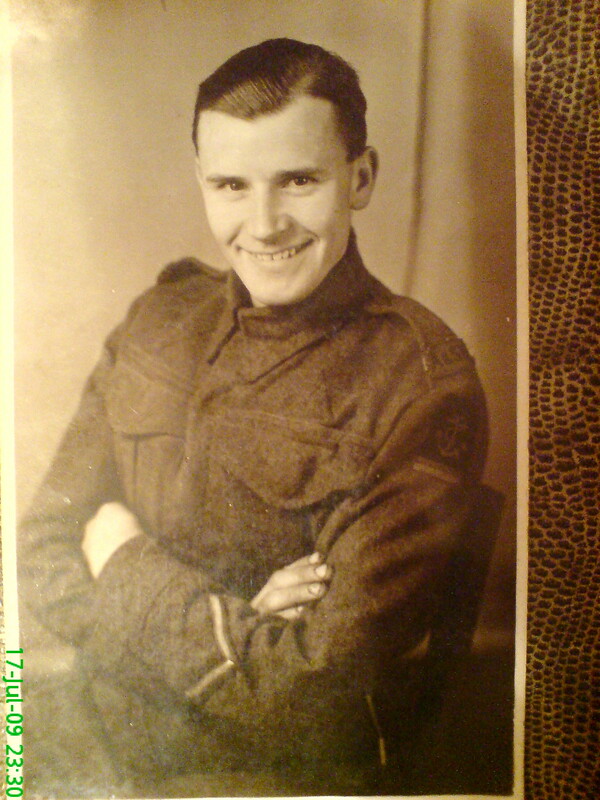 After the war my Great Uncle decided to move to Australia because he’d been impressed by the Australians he’d fought alongside. My maternal grandfather was conscripted into the army at the age of 30 and became a driver with the Royal Army Service Corps. He was posted to the 1187 Company RASC in the Far East. This company was a theatre asset directly controlled by South East Asia Command and was equipped with DUKW. He would have directly supported General Slim’s Forgotten Fourteenth Army. When in rear areas my grandfather used to drive the officers into town and then go for a curry while they enjoyed their evenings out. He then drove them back to camp at the end of the night. He rarely drunk and managed to come back from the war with most of his pay saved up. One new year his mates got him very drunk and he ended up with a Black Cat tattoo. The Black Cat was the 17th Indian Division insignia, part of the forgotten fourteenth. The tattoo he got was the same as that (I remember asking him about it as a small boy, he hated the tattoo). My grandfather didn’t speak a lot about the war. My mother doesn’t remember him saying anything about it at all, but he spoke to me a couple of times about it. I also got some stories via my Gran as well, so he must have spoken a bit to her too. Our birthdays were a week apart, and when I was eight I got an action man set for my birthday and I was showing it to him. He told me about driving his DUKW through the jungle and across rivers. There were no roads to speak of, and he was usually driving ammunition forwards. He told me that he used to have a sten gun and two grenades on the seat beside him in the cab. As the drove through the jungle at night they could hear the Japs moving around and sometimes shooting or explosions. He said it was very scary and they never knew if they were going to make it. Looking back the tale was clearly a sanitised version told to a small boy. I’ve read Bill Slim’s Defeat Into Victory and it paints a grimmer picture even than that. I tried to get the 1187 RASC Company war diary from the National Archives a few years ago and was surprised to find that it was still sealed, even though most of the NW Europe war diaries had been published. By the time they are opened all the stories will have been forgotten. My grandfather was a keen amateur photographer, and my mum has an album of his photos taken in training with the DUKWs. He also has a set from Calcutta (now Kolkatta) of the town and people in it. One day I’ll get them digitised, they are a fascinating set. Do you have any stories of the Forgotten War, if so leave a comment.